Wow. Still, lest my head grow too large, here’s a damn-with-faint-praise review from The Truth About Books that puts me right back in my box: ‘I actually liked it,’ is the verdict, although ‘perhaps psychological thriller and bird watching shouldn’t be mentioned in the same sentence’. Not bad from someone who doesn’t like birds, I suppose. A quick reminder if anyone’s interested – I will be on Simon Mayo’s Book Panel at 3pm today. The other guest on the panel will be the brilliant Tim Winton to discuss his new book, Breath – I’m moving in exalted company these days. If you miss the program, it’s available as a podcast – I’ll put a link up after the show. Roger Morris – author of Taking Comfort and also (as R.N. Morris) of A Vengeful Longing and A Gentle Axe – has taken time off from his plogging, and battles with his arch enemy, the cat, to interview me on Vulpes Libris. 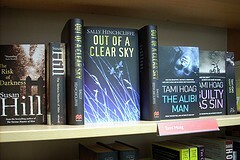 Out of a Clear Sky has been selected as the book of the month for Simon Mayo’s Book Panel. ‘The best in new writing’ is its tag line – I couldn’t possibly comment. Anyway, if you want to comment, go over and have a look, you can download the first five chapters and write your own review, and the best will be read out on air. I’ll keep you posted with more details about this, including broadcast dates and times. My virtual book tour continues here, at ManiacMum, where Jane Henry has some interesting questions about birds, birdwatching and writing in general. No, I’m not looking for him, but it’s the name of Caroline Smailes’s blog, where she’s hosted another stop on my tour. She’s interviewed me about the process of getting published, finding an agent, and how I started off as a writer. Please stop by and have a read. And I’m going on real tour – well sort of – tomorrow. Down to London for writLOUD tomorrow, and Heffer’s Bookshop in Cambridge on Tuesday to meet their book group. Not mine, of course, but the title of Kay Sexton’s blog where you can read an interview with me, along with many other lovely posts of a mostly literary nature.